Be sure to scroll to the bottom of the post to enter the giveaway! I absolutely love this book series! The illustrations are whimsical, with a subtle painterly quality. The different bears are just too cute!!! Even better, the messages they portray are wonderful for children of all ages as well as parents. As a family who has adopted our children, I'm always on the lookout for books that are enriching and supportive of the adoption experience. 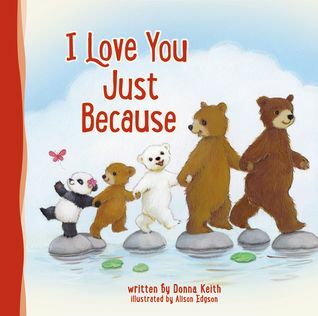 These particular books are especially meaningful for families with children that have differences from each other- physical or personality-oriented, so they work for both adoptive and traditional families. I Love You Just Because reassures children that they are unconditionally loved and valued for who they are as a person. The addition of Biblical scripture references reinforce God's love as well, and make the book an easy resource for including young children in scripture study. There are several examples of how the young bears feel different from his/her siblings, but is always accepted by each other and the grown bears- both parents and grandparents (who are so fun!). The sturdy cardboard pages are perfect for toddlers and the 8" x 8" size is large enough to enjoy the pictures without being overly big. I highly recommend this book and its predecessors for all families with young ones!